A new original folk-rock musical? It's like Fly By Night was created (by Will Connolly, Michael Mitnick, and Kim Rosenstock) and brought to the Jungle (by director Sarah Rasmussen) just for me. 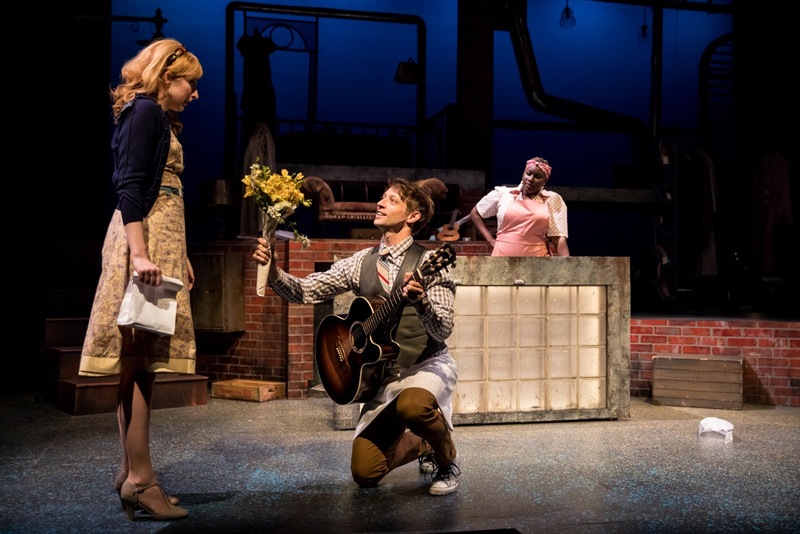 The rare bird that is the new original musical is my favorite thing in the world, and folk-rock/folk/Americana is my favorite genre of music. I was primed and ready to love this show, and love it I did. Charming and funny yet poignant, with a fantastic score played by greats from the local music scene, and a cast that couldn't be better - what's not to love? Well maybe a few things - a bit of the ending I didn't love, and a confusing timeline issue. * But other than that I loved everything about this show that is right up my alley, and I hope to get back to see it before it closes on July 23. The story is set in New York City in 1964-5, culminating on the night of the city-wide blackout (that actually affected several states) on November 9. The story is told to us by a narrator in a sort of round-about way, jumping forward and backwards in time, foreshadowing and filling in the gaps with flashbacks. This may sound confusing but it's really not; rather it's a clever storytelling device that builds the show thematically and emotionally rather than chronologically, and it's fun to revisit moments we've seen before with a greater understanding of what they mean. The narrator tells us that the story is built around a love triangle between sisters Daphne and Miriam from South Dakota, who've just moved to the big city, and Harold, a sandwich maker and aspiring musician who has just lost his mother. Daphne wants to be a Broadway star and is thrilled when a playwright from an influential theater family casts her as the star in his new musical, even though this interferes with her relationship with her new beau Harold. Miriam is happy being a waitress, until a fortune teller prophesies that she is going to meet her soul mate (you guessed it - Harold) and then have a great fall (and not as in the season). Destiny, connections, fate, and choices all have a role to play in this mostly sweet story about these mostly likeable characters. This cast simply could not be better, starting with Jim Lichtscheidl as the narrator, who also plays many characters including the fortune teller and the sisters' mother, as well as too many brief characters to count. He's so wonderful at transforming into widely different characters with a slight change in physicality or voice. He rarely leaves the stage, and the audience is in good hands as he leads us through the twists and turns of this story. For the apex of our triangle, the Jungle has tapped local singer/songwriter Chris Koza, making his professional theater debut. His inexperience in the theater is perhaps an asset; his natural charm shines through without artifice or affectation in the portrayal of the sweet and sheepish guitar-playing sea turtle-loving Harold. Out of towners Royer Bockus and Leah Anderson play the sisters, both with lovely voices. Royer's Daphne is all plucky drive and ambition, while Leah's Miriam is more girl-next-door; two very different sisters who love and support each other. Familiar faces from the local theater scene fill out the rest of the cast, including James Detmar, just heart-breaking as Harold's grieving father; Joshua James Campbell as the dramatic fur-wearing playwright, with some really funny bits and one of the funnest songs "What You Do To Me;" and Joy Dolo as Harold's boss at the sandwich shop, a role originally played by a man but one she plays hilariously as if it were written for her. I instantly fell in love this score (as I expected to); a score in a style that I'm going to call infectious retro-folk-pop-rock. Until this fabulous cast makes a recording, I've downloaded the 2014 Off-Broadway cast (featuring one of my Broadway faves Adam Chanler-Berat) to which I will listen obsessively in the next few weeks, as I do. 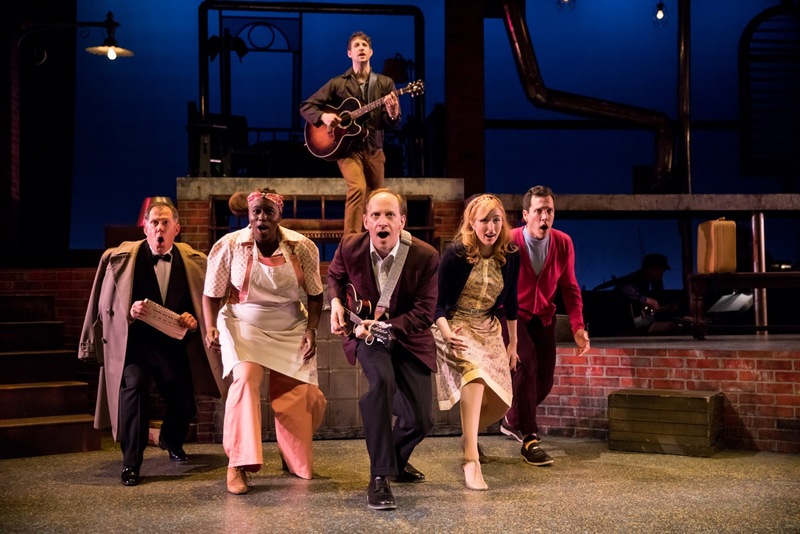 In addition to Chris/Harold on guitar, Royer/Daphne on ukulele, and Jim/Narrator on occasional mandolin or tambourine, the cast is backed by a four-piece onstage band led by NYC-based music director Mark Christine, and including local musicians John Munson (Semisonic, The New Standards) and Dan Schwartz (the only musician in the show with which I was previously familiar, since my musical tastes are more Radio Heartland than The Current). Current favorite songs are Miriam's poignant ballad "Stars I Trust," Harold's rockin' turtle song "Circles in the Sand," and Daphne's longing anthem "I Need More." The multi-level set invokes NYC with its stoop, fire escape, and brick walls, from which drawers open to reveal lunch counters or diner booths. Even scene transitions are entertaining, as ensemble members quickly and with style bring in the props and furniture needed, with lots of tossing and catching (movement designed by Jim Lichtscheidl). The cast is dressed in cute, retro, character-specific costumes, detailed and thoughtful from head to toe, where I could see from my front row seats, aka shoe level, that even the choice of socks is flawless (set design by Joseph Stanley, costume design by Trevor Bowen). 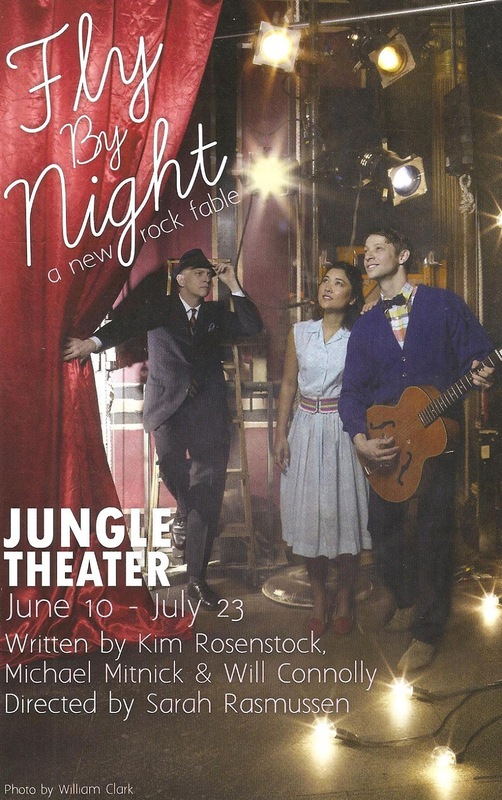 Thanks to the Jungle Theater for bringing this charming new musical to Minneapolis and assembling this multi-talented cast and creative team. It's (almost*) everything I want in a musical. 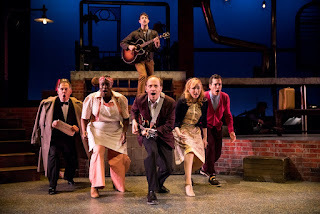 Fly By Night is a delicious summer confection with much heart, humor, and poignant moments (continuing through July 23 and well worth braving the ever-worsening traffic/construction/parking issues in Uptown, just give yourself plenty of time to get there). *SPOILER ALERT! If you've already seen the show and are interested in reading my thoughts about the ending and the questionable timeline, click here.